On Saturday, we made had a bathroom shopping spree at Home Depot, spurred by a coupon and a great need for a tub. Four carts total including: three Kohler Highline toilets, one American Standard jetted five-foot tub, 12 sheets of concrete board, a stack of two by fours, a sink and tub faucet (Kohler Mistos) and a Rheem tankless water heater. Our coupon took $200 off (that was the max) and we got another $300 off because Ben found the same water heater online for about $150 less than Home Depot’s price. Remember, Home Depot has a ‘meet and beat’ policy. So they matched the online price and beat it by 10%. We love that policy. I mentioned here that I was trying to talk Ben into my lighting plan. Well, he has agreed to it. What is that plan? I want to use pendants in place of sconces in the bathroom. Yes, I said pendants. So we looked at HD’s options, seeing two things I like. This Home Decorators bubble pendant for $70 each. And this cylindrical glass pendant for $80 each. While I liked the style, I’d like to stay under 100 bucks for both pendants. Then I looked at Lowes, where I found a few more options. I really wanted to use these pendants in the kitchen, and quite like them for a bathroom. At $41 each, we’re under budget, but Ben has a requirement of using standard sized bulbs so we’re not on a wild light bulb hunt when we need replacements. Too bad these are tiny little bulbs. I do like this ORB cylinder pendant for $48. Similar to the one above, but I like that the bulb is concealed. We prefer to use CFL bulbs to cut down on consumption, but they’re not pretty. The style is great, but we’ve got chrome faucets and other chrome accents. Too bad this only comes in ORB. I’m still considering it though. 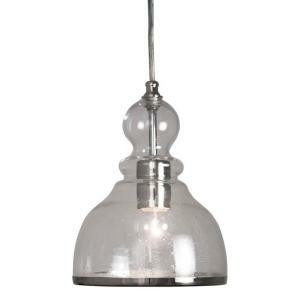 I also like this polished nickel pendant for $48. 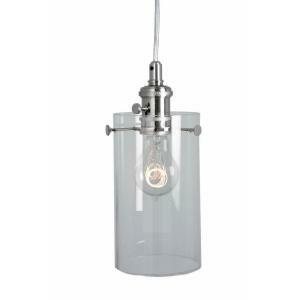 It’s chrome, a mix of traditional/industrial style, and takes a standard bulb. However, I’m concerned this won’t give adequate lighting. Right now, the only light in the bathroom is from two small sconces. We bought a Sky Tube to add natural light, but we probably won’t have an overhead light in the ceiling. So, what to do? Do you have similar lights? Are they bright enough? Which style do you prefer? Are you on board with pendants in place of sconces? I’m excited for it. Ahhh! Do you love making those big purchases or do they leave you a little nervous? I would be so excited even if it’s such a big amount. I’ve been helping my parents with their bathroom and had them install the cylindrical pendant (Home Decorators, from Home Depot). It’s a little pricier but the scale was so perfect for their space. They needed three to fill existing junction boxes. Hey Emily, You know, I like it. It’s nice because it’s progress. Love the pendants you used and we got the same faucet. 🙂 Thanks for sharing!! The pendants will be a nice change of pace from the sconces. If there’s anyone who can pull it off and make it look “meant to be,” it’s you and Ben! I’m sure whatever you choose will be beautiful, as always, but you might think of looking at outdoor pendants. I did this for my kitchen over our bar. I found two fabulous nickel lanterns on closeout at my local lighting shop. They were regularly $299 each and I got them for $50 each when I agreed to take the floor sample. The great thing about outdoor lights is that they tend to be a little larger than indoor and provide an excellent amount of light. Love the pendant idea! As long as the light is high enough that it doesn’t shine in your face – might be blinding! Do you have a bathroom fan in that bathroom? You might want to find a fan with an overhead light (and a nightlight) if you are worried about the lighting issue. We have several Panasonics in our house that have an overhead light and the nightlight – which we keep on all night for our kids’ midnight trips to the bathroom. They work great! I love the pendant instead of sconces. What we also have in our bathroom that I love is rope lighting tucked up underneath the vanity and recessed lighting set to 3 switches so you can have some or few on at a time. It really helps focus light where it’s needed like the tub, shower, or vanities. I can’t wait to see how this turns out!! I like the bubble one the most out of those. I agree with motheroffashion, outdoor lights might be worth a look too. Can’t wait to see the transformation! I understand Ben’s reluctance to use nonstandard light bulbs. We have some lamps that use bulbs that used to be available at Home Depot, but last time I needed some they were unavailable ANYWHERE locally. An internet search led me to Light Bulbs Unlimited (which must have lots of other names because whenever I call them, they answer with something else). I ordered a stash of my light bulbs (one shipping rate for any order) and each bulb was about one-fifth of what I had been paying at HD. I didn’t think they had what I needed when I searched online, but when I called and described what I wanted they gave me the item number and I placed the order. Just something to keep in the back of your mind. I just came to your blog from a link on another blog I follow – can’t wait to see all you do with your new home. I would say that your banner for your blog does not really show up – the only thing a person’s eye goes to is your photo which is pretty distracting – might think about updating it. I love the first pendant! It reminds me of the blue one YHL just hung in their bathroom! Maybe you could find it online for a better price?? I desperately want to know where you found a SkyTube. It’s the most irritating thing in the world, we need them SO BAD but our local Lowes AND Home Depot have NEVER heard of it!!! ARG! So if you tell me that yours had them, I swear I’m going to call corporate and ask that they better educate their employees on items they (should) stock. We got pendants just like “this ORB cylinder pendant for $48” but in brushed nickel at Menards last year – I think they were even in the $30 range – hope it helps! I have that Lowe’s ORB pendant over my kitchen sink, which has a chrome faucet, and IKEA chrome track lights. I don’t think the mix is bad at all. Wow, thanks for the input everyone! Hi Emily! I’m 90% sure we got the main bath (at our first house) at home depot several years ago. We bought the newest one on Craigslist. I’m not at my computer, but I’ll try to find a link for you. They make light kits to put inside skytubes (aka solar tubes) for pretty cheap. Since you said you want to go with your first choice in this house, go with the pendants you love and then get the light kit as a back up to use on those cloudy days or at night if you find the pendants aren’t as bright as you want them to be.